The slide notes that the heaviest use of Roundup, Monsanto’s flagship weedkiller, began in 1990 and continued to rise since. 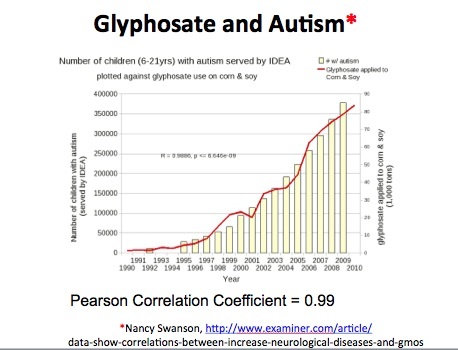 Meanwhile, the number of kids with autism has gone from 1 in 5,000 in 1975 to 1 in 68 today, a puzzling and frustrating stat that shows no signs of slowing down and one that correlates strongly with the rise in glyphosate use. Of course, autism is a complex problem with many potential causes, but the numbers are particularly of note considering how close the correlation is, and Seneff’s credentials. Dr. Seneff has written 10 papers (7 as the first author) in various medical and health journals on modern diseases as well as drug side effects, nutritional deficiencies and the impacts of environmental toxins on our health. She also worked as a Senior Research Scientist at the MIT Computer Science and Artificial Intelligence Laboratory before turning to biology, as her official biography notes. You can read more about her presentation on the website The Complete Patient by clicking here,and you can also check out the full versions of her slides on glyphosate and autism by clicking here. EPA Debating Roundup Ban or Restrictions, Are They Being Objective? Recently, the group Moms Across America visited with officials from the EPA to discuss a potential ban or restrictions on Roundup, especially in light of recent findings that the active ingredient glyphosate is found in the breast milk of American mothers at levels that are a dangerous 760 to 1600 times higher than allowable limits in European drinking water. While the group made its point loud and clear, it is well worth noting than many of the 100 studies provided for the EPA’s review were actually provided by the chemical companies themselves. Urine testing has also shown that Americans have 10 times the glyphosate accumulation in their urine than Europeans, and children with autism have many biomarkers indicating excessive glyphosate in their systems including key mineral deficiencies, seizures and mitochondrial (the cell’s power center) disorders. While Monsanto claims that Roundup is harmless because humans don’t have a shikimate pathway, which it inhibits, Seneff notes that our gut bacteria do have this pathway, and that’s crucial because these bacteria supply our body with crucial amino acids. She also says that most studies are too short to show Roundup’s oft-studied effects as a cumulative toxin, one that builds up both in the environment and in our bodies over time. According to Seneff, Roundup has the following side effects: it kills beneficial gut bacteria, allowing pathogens to grow; interferes with the synthesis of amino acids and methionine which leads to shortages in critical neurotransmitters and folate; chelates (removes) important minerals like iron, cobalt and manganese, and much more. Additional chemicals in Roundup are untested because they’re classified as “inert,” she notes in her presentation, but according to a 2014 study in BioMed Research International they are capable of amplifying the ill effects of Roundup hundreds of times over. To learn more about Seneff’s warning over autism and Roundup accumulation, you can view her slideshow on the topic. Until then, it’s best to exercise caution, and to buy and grow organic food whenever possible. Previous articleSix Super Easy, Healthy & Delicious Frozen Snacks you can Make at Home to Beat the Summer Heat!